Art house film lovers should be familiar with this theater as the location of T-Mobile's New Horizons IFF - Poland’s largest film festival. The New Horizons Association, headed by Roman Gutek, runs the theater and controls all of its programming. Its nine theaters now feature art and auteur cinema as well as quality independent middle-of-the-road cinema. The cinema offers various film education projects, broadcasts from the legendary The Metropolitan Opera, cinematic reviews and festivals, encounters with film for children and senior citizens, exhibitions and concerts. Additional attractions include the cinema’s bistro with delicious food at reasonable prices, a poster gallery, and a bookstore with film literature and DVD films on sale. 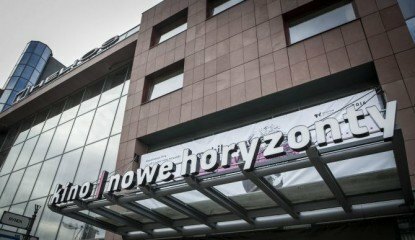 The New Horizons Cinema program is part of the larger Wrocław European Capital of Culture - 2016. The non-profit New Horizons Association runs the theater and controls all of its programming. One of the arguments behind moving the New Horizons International Film Festival to Wrocław was the opportunity for the Festival’s development afforded by a large city. Right after the first festival held in the city in 2006, it was obvious the decision was correct. Since that time, the Wrocław’s celebration of cinema has dynamically grown; it is currently Poland’s largest and one of its most important film festivals. Those are reasons for joy and pride. However, ever since I came to Wrocław, I’ve been asking myself how to make this New Horizons cinematic celebration not end when the festival does, but to have it last throughout the year. Over 500 Polish films have been produced in Wrocław; it was once the location of a dynamically developing film culture with several quality studio cinemas. However, in recent years, the city has lacked a theater showing ambitious Polish and foreign films. As a result, many interesting works often never made it to Wrocław and it was not possible to see film classics on the big screen here. Meanwhile, modern cinema continues to thrive as an important part of international culture, an art form that is relatively easily accessible. Cinema is an easy way to learn more about the world and various cultures, a way that also offers spiritual enrichment. Nearly one year ago, the idea appeared to transform the Helios Cinema on Kazimierza Wielkiego Street into a multiplex that presents art, auteur, experimental films as well as quality independent middle-of-the-road cinema. The intent was for it to be a cinema without Hollywood blockbusters (or popcorn) that would instead offer an expanded education program for children and young adults, festivals and reviews as well as special events to promote film culture in Wrocław. It would be a cinema with a film offer for preschoolers and their parents as well as for senior citizens. Such a cinema, just as in most large European cities, would have to be financed partially from the city budget. The idea was very well received by city officials and included as an important project of the program for Wrocław European Capital of Culture - 2016.